What are my Decoder Options? Current production Atlas and Kato HO scale engines have the standard 8-pin NMRA medium DCC plug. However, space is sometimes very tight inside these engines, limiting the decoders that will fit or requiring removal of weights (see our pages showing installations of decoders in these models). Older model Atlas and Kato engines (which includes older model Stewarts, as they also used a Kato mechanism) do not have a DCC plug, which requires hard wiring a decoder, sometimes with limited space. 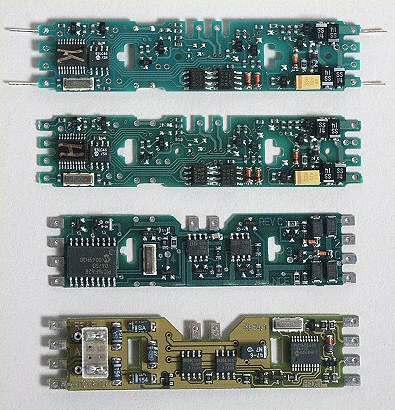 Four manufacturers (Atlas, Digitrax, North Coast and Soundtraxx) make DCC decoders shaped to replace the engine’s original circuit board (which contains the circuitry required for lighting, and the connections between the trucks and motor). Some of these decoder installations use the existing clips to connect the trucks and the motor, or those connections may be soldered for extra reliability. Although marketed as “plug and play,” almost all installations will require some soldering to connect lights, and the installation may take anywhere from 30 minutes to two hours (mostly depending upon the lighting issues for a specific model engine). Recently TCS added a decoder with this form factor. Atlas is also offering a four function version of their decoder. These lighting board replacement decoders make for a cleaner and very reliable installation in Atlas/Kato/older Stewart engines without a DCC plug, and may be the best option in newer engines where space is at a premium, or where you desire sound (using a Soundtraxx KT100LC or AT100LC decoder). Pictured, from top to bottom: Digitrax DH150K, Digitrax DH150A, NCE DA-SR, Atlas 340. The Digitrax DH150K and DH150A are the same decoder, with the “K” version modified (four wires presoldered on) to accommodate the motor tabs and track pickups in Kato engines (this avoids the need to solder the pickups and motor leads – but you still have to solder most lighting). It also comes with spacers and screws to make installations in some specific models (Kato GP30 and GP38) easier. Atlas Master Series GP38: Easiest Decoder Install Yet - Comes Built-In!